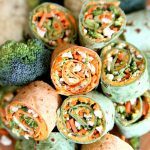 Vegetable Tortilla Roll Ups with a creamy cheese filing and loaded with fresh vegetables. Slice and serve for an easy appetizer. Spread cheese evenly onto tortilla. Start at one end of the tortilla and roll tightly. Add a little extra cheese to the end to keep in tortilla in place. Slice each roll into 8 pieces.